When you are pregnant, you must be very careful about which antibiotics you take and how they are administered. Certain illnesses and conditions may be passed along to the baby if left untreated – but some medications can cause more harm than good. You have the right to expect your doctor to know which drugs are safe and which can do serious damage. At Paulson & Nace, PLLC, we protect the rights of families whose futures have been put at risk because of a doctor’s failure to administer antibiotics and delivery drugs in a safe and timely manner. Since our inception, our firm has helped clients throughout Washington, D.C. obtain the compensation they need to help their families after an act of medical negligence. Our father-and-sons team understands how serious one mistake can be, and how it can affect your loved ones in the long run. When your family has been harmed, our family wants to help. Which illnesses may require antibiotics? Group Strep B. GSB is a very common illness, so doctors are supposed to test pregnant women for it between 35 and 37 weeks into the pregnancy. When GSB is diagnosed quickly and correctly, a doctor can administer antibiotics during labor, to avoid passing the illness along to the child. If GSB is not diagnosed, your child could develop cerebral palsy, brain damage or hearing and/or vision loss. Sexually transmitted diseases. Some STDs can be cured with antibiotics; others cannot. If the mother is infected with the Trichomoniasis parasite or gonorrhea, for example, antibiotics can help the mother avoid passing the infection along to her child. Without antibiotics, the child may be born preterm or have a low birth weight. Some STDs have also been linked to miscarriages, so it is important to seek a test if you believe you might be infected. Chorioamnionitis. This bacterial infection is rare, but if left untreated it may necessitate the immediate delivery of your child. Babies born with chorioamnionitis may develop other infections, like sepsis, have brain damage or develop meningitis. In some cases, this can develop into a condition called villitis, which may be fatal if left untreated. Chicken pox. Though chicken pox is unpleasant, it can be treated with antibiotics. If left undiagnosed, however, your child could develop a rare condition called fetal varicella syndrome (FVS). FVS causes catastrophic abnormalities, including shortened limbs, scarring and developmental delays. 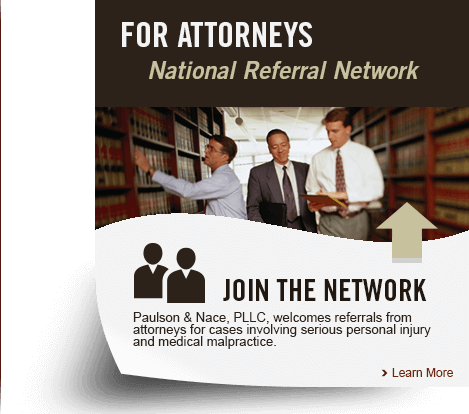 Paulson & Nace takes on intricate birth injury cases like these to help families when their loved ones have been harmed because of negligent labor and delivery and postpartum care. If you or your baby has suffered because of an untreated infection, we want to hear your story. Women who choose natural childbirth may request an epidural to help with the pain. In cases where the labor has stalled, or a mother-to-be has gone past her expected due date, a doctor may use a drug called Pitocin to induce labor. Drugs like these can help ease some of the stress of delivery for the expecting mother. If they are administered incorrectly, however, they can have serious side effects. Pitocin causes a woman’s contractions to speed up. If too much is administered, or if the mother is not monitored, the contractions can become too strong and happen too quickly. This can crush the baby’s skull or deprive the child of oxygen, which can lead to brain damage. Pitocin may also lead to lower Apgar scores. Mistakes made with anesthesia epidurals can cause a mother’s blood pressure to drop dramatically; other women develop fevers. With a fever comes an increased risk of seizures, low Apgar scores and problems with muscle tone in the baby. If you or your child has suffered because of an epidural or Pitocin administration error at a Washington, D.C. hospital, Paulson & Nace may be able to help. Antibiotics must be administered correctly in order to give you and your child the best chances of a heathy birth. At Paulson & Nace, PLLC, we protect Washington, D.C. families by providing tenacious representation in jury trials and in settlement negotiations. If you believe you have been a victim of medical malpractice, please call 202-930-0292 or fill out our contact form.